A solid amount of the present-day success of the Ottawa Senators and St. Louis Blues can be attributed to one very important person: new Columbus Blue Jackets general manager Jarmo Kekalainen. Hired Wednesday by the Blue Jackets, Kekalainen's keen eye for talent at the NHL Draft is the biggest item on his resume. Kekalainen spent eight years with the Senators (1995-2002) as the team's chief European scout and as director of player personnel. In these roles, he helped with drafts that landed the Senators some of the core players from the team that went to the 2007 Stanley Cup Final and who continue to play key roles today. In his first three drafts, the Senators selected defensemen Bryan Berard and Chris Phillips and forward Marian Hossa in the first round. 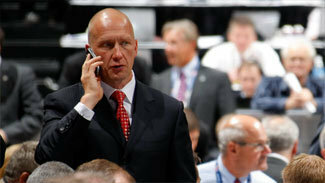 They also found defenseman Sami Salo in the ninth round in 1996. In 1998, they snagged Mike Fisher in the second round and Chris Neil in the sixth, and the 1999 draft produced first-round pick Martin Havlat and Chris Kelly, a third-round choice. In 2000 Kekalainen landed Anton Volchenkov in the first round and Antoine Vermette in the second. In 2001, the headline choice was center Jason Spezza, but in the fourth round Kekalainen found goalie Ray Emery, who was the starter on the Cup team, and defenseman Christoph Schubert. The Senators also chose Brooks Laich in the sixth round that year. Kekalainen moved to the St. Louis Blues in 2002, and in the next eight years as a scout and assistant general manager, he oversaw drafts that placed seven players on the team that finished second in the Western Conference last season: David Backes, Roman Polak, Ryan Reaves, T.J. Oshie, Patrik Berglund, David Perron and Alex Pietrangelo. Kekalainen also helped the team draft a few other players who helped in other ways. The team's first pick in 2007, Lars Eller, was part of the package traded to the Montreal Canadiens for goalie Jaroslav Halak. Erik Johnson, the first pick of the 2006 draft, was traded to the Colorado Avalanche for a package that included defenseman Kevin Shattenkirk. And defenseman David Rundblad, the team's first pick in 2009, was dealt to the Senators for the pick that was used on talented rookie forward Vladimir Tarasenko. In Kekalainen's last draft with the Blues, he made the call for the team to select a pair of forwards who certainly appear poised to make a major impact going forward: Jaden Schwartz, who has one assist in nine games this season after scoring twice in seven games last season as a 19-year-old, and Tarasenko, who is tied for the lead in goals among rookies (five) and is second in points (10), and was named the NHL's Rookie of the Month for January. Other Blues players Kekalainen brought into the organization who could help going forward include goalie Jake Allen, forward Philip McRae and defenseman Ian Cole. While Kekalainen is best known in North America for his draft acumen, he's had tremendous success running all facets of teams in his native Finland. During his first four seasons working for the Senators, he also served as GM of HIFK, which won the SM-liiga title in 1998-99. He left St. Louis after the 2010 draft to take the job as GM of Jokerit. In his third season, the team has a nine-point lead atop the SM-liiga standings.